Woody and Buzz Lightyear are back in the sequel to the '95 computer-animated hit. This time, Andy's off to summer camp leaving his toys to fend for themselves. 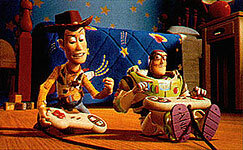 But when Woody is kidnapped by a toy collector, it's up to Buzz to rescue him before Andy gets back from camp.